This pie is of Irish influence, because St. Patrick’s Day is right around the corner. 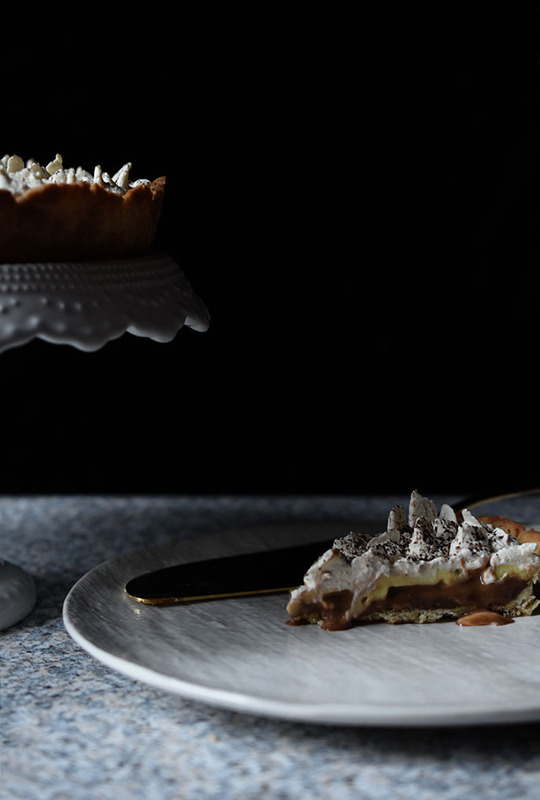 We tweaked the traditional English Banoffee Pie by adding coffee and Irish Whiskey! Oh, and some chocolate, because everything (even whiskey!) is better with chocolate. Use your favorite pie crust or tart shell to hold all of these delicious layers. 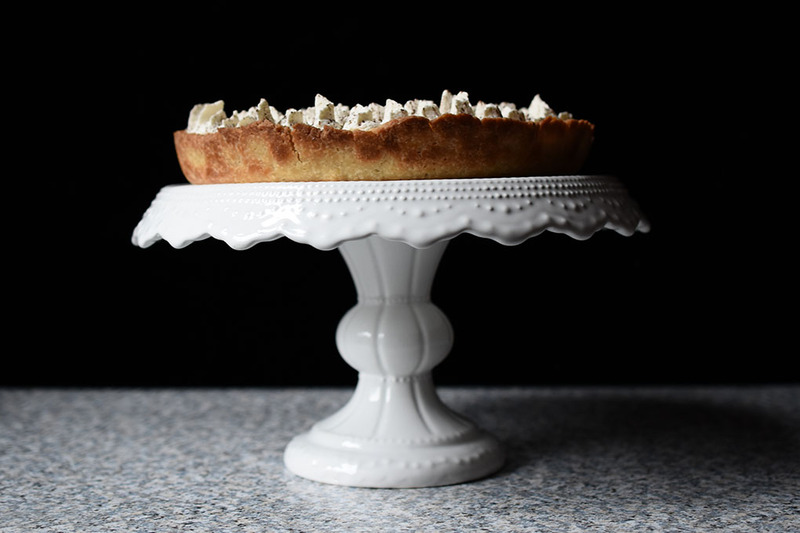 Our Shortbread Tart Pastry or our flakey Double-Butter Pie Crust are great choices. 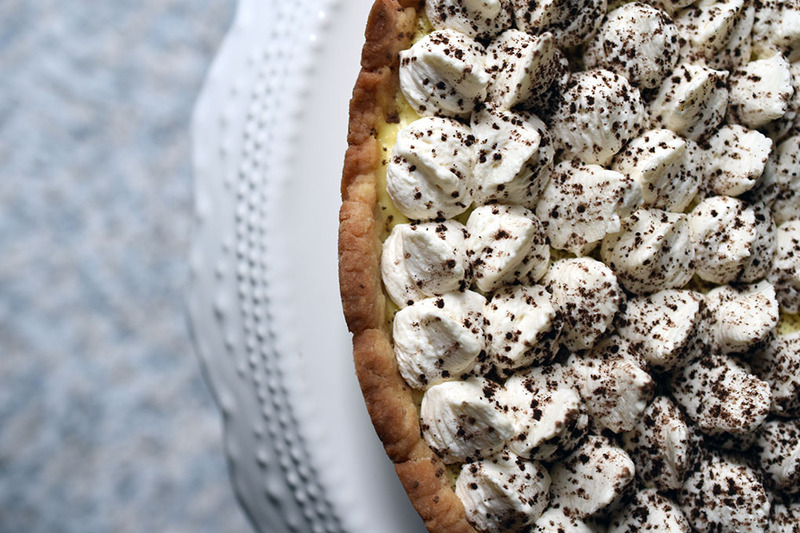 There are a bunch of steps in assembling this pie, but don’t let it scare you. Every component can be made in advance of assembling, except the Whiskey Coffee Whipped Cream at the end, so you don’t have to spend half your day in the kitchen. 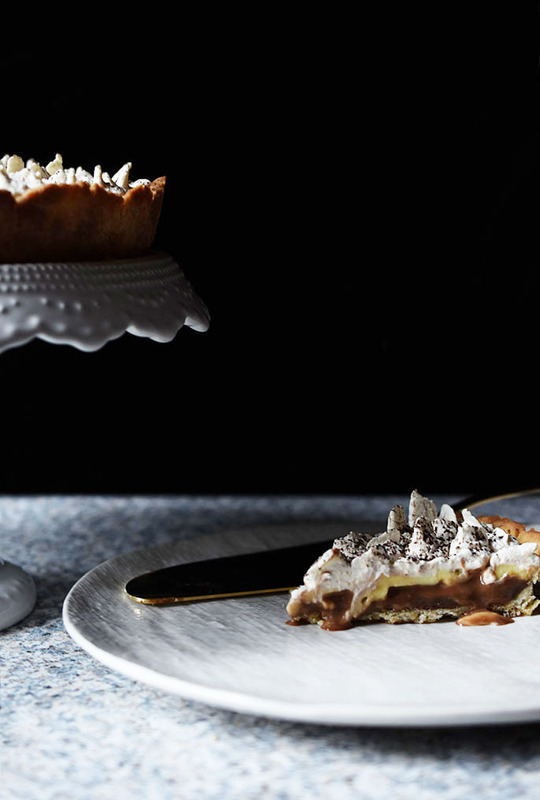 However, if you decide to make this pie all at once, we suggest baking your pie shell first, followed by the Whiskey Toffee and the Whiskey Cream. Assemble the layers and whip up your whipped cream layer before serving to finish it off. Feel free to add additional booze or change the whiskey to bourbon, if that’s your preference. Either way we hope you enjoy this boozy ADULT pie! Author: Adapted from... multiple sources. 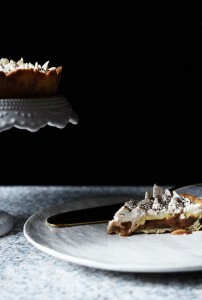 A Banoffee Pie with a boozy twist. Fully blind bake your pie shell. Allow the shell to fully cool before filling. 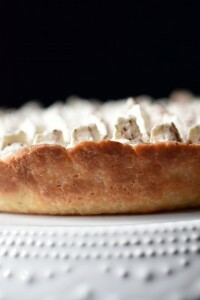 Pour the sweetened condensed milk into a shallow baking dish, stir in the salt and cover tightly with foil. Place the filled shallow baking dish in a larger baking dish and fill the larger dish with hot water until it reaches halfway up the sides of the filled baking dish. Bake for 1 - 1½ hours, adding more water to the outside pan as needed. The toffee is ready when it is browned and caramelized; remove from the oven. While the toffee is still warm, stir in the chocolate, butter and whiskey until smooth and combined. Let cool, out of the water. Toffee can be made several days ahead, store in the refrigerator. Warm slightly over a double boiler or in the microwave, stirring frequently, before using. Heat the half-and-half, salt and ½ cup of the sugar in a medium heavy-bottomed saucepan over medium heat until simmering, stirring occasionally. Be careful not to scorch the half-and half. Meanwhile, hand whisk egg yolks, cornstarch, and the remaining ½ cup of sugar in a medium bowl until thoroughly combined, pale yellow and thick. When half-and-half mixture reaches full simmer, gradually whisk the hot mixture into the yolks to slowly temper. Do not dump the hot half-and-half in all at once or you risk scrambling the yolks. Return mixture to the saucepan and return to a simmer over medium heat, whisking constantly, until the mixture thickens and is glossy, about 30 seconds. Take off the heat and whisk in the butter and whiskey. Whisk occasionally while cooling to room temperature. Top the toffee layer with a nice even layer of sliced bananas. Make sure you slice the bananas right before assembling. Otherwise, you risk the bananas turning brown. Top the bananas with the slightly cooled whiskey cream, we pressed our cream through a fine mess sieve before filling for a smoother texture (this is optional), filling only to the top of the crust. Refrigerate any leftovers. Press plastic wrap directly against the surface of the whiskey cream to prevent a skin from forming and chill until completely cool. In a standing mixer fitted with the whisk attachment, whip the heavy cream, coffee, whiskey, and powdered sugar to soft peaks. Add the vanilla extract and whip until stiff peaks form. 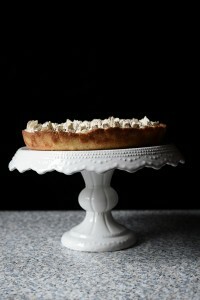 Spoon or pipe the whipped cream on top of the pie, serve cold. The pie is best served the day it’s made, but will keep for a day in the refrigerator.